During London Fashion Week SS17, Crabtree & Evelyn sponsored Fashion Scout; a fashion showcase for up and coming designers. Our challenge was to bring the sponsorship to life on social media and promote the hand therapy ranges. The campaign had to resonate with a new fashion-focussed social audience, delivering an increase in engagement, growth and brand reach. In the week leading up to Fashion Scout, Catch launched the Crabtree & Evelyn Hand Rescue Squad; a team of hand masseuses committed to soothing tired hands for fashionistas across London. The Crabtree & Evelyn UK social audience was given the opportunity to win goodies and a visit from the Hand Rescue Squad. The competition was amplified using social advertising that targeted millennials with relevant interests to the Fashion Scout campaign, such as fashion, beauty and fragrance. The initiative allowed us to capture content of the audience interacting with the brand and the products that would be present at the event. Influencers were also visited by the squad and helped to promote the launch by regramming and sharing their own content. Coverage included Kat & Bee Jewellery, GlossyBox, @DRESSR and The Perfume Society. At the Fashion Scout event, we gave fans the insider view: from behind the scenes interviews and competitions, to sneak peaks of the catwalks and new products. To capitalise on the popularity of video content and to provide a consistent narrative for the Fashion Scout and LFW activities, we partnered with influencers to share their experiences at the event. This ensured we had an authentic perspective that could be amplified to new, fashion-focussed audiences. A wide range of exciting content was captured at the Fashion Scout including show previews, interviews with designers and features with the Hand Rescue Squad. It was also the first time the brand had used formats such as 360 imagery, Instagram Stories and Facebook LIVE. 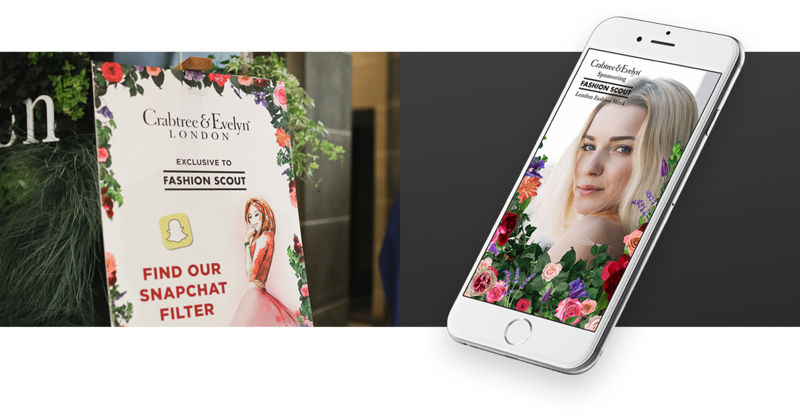 A snapchat geofilter was designed to promote the Crabtree & Evelyn’s sponsorship of Fashion Scout, whilst encouraging engagement and advocacy from the attendees of the event. This helped to extend the reach of the campaign to the Snapchat audience, which is a new channel for the brand. The campaign achieved the highest growth ever on the Crabtree & Evelyn UK Facebook channel in a three-week period.